The SHP (Seeburg High Power) amplifier was introduced with the SPS160 Olympian of 1972, and was standard equipment in all machines up to and including the last vinyl jukebox, the SMC3 of 1984. The 100-selection machines (Topaz, Celestia, SMC1 Jr.) used a lower-powered version, the SHP2 which is also covered. This manual tells you everything you need to know about: the Preamplifier, tone, balance, and volume controls, the driver board, the S.O.S. 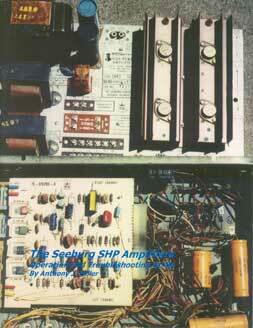 (Save Our Sound overload circuit), mute/trip relay, the output transformers and power supply. The output transistor bias circuit gave plenty of problems with this amplifier, causing some early units to catch fire and prompting the change to the later bias circuit. The solution to this problem, along with a more accurate method of setting the bias, is discussed at length. Also covered is how the AVC (Automatic Volume Control) works, and a detailed explanation of how the drivers and outputs work. Also included is a semiconductor cross-reference (worth the price of the book alone), component views of both PC boards, and schematics for all three amplifiers.